Invented in Paris in the 1840s, this bellow powered musical instrument has reached an unmapped region in it’s history: Guanghzou (Canton). The European harmonium was brought to India by Christian missionaries. It seemed to have ended it’s travels with the great wall of China blocking it for a couple of centuries. It settled down in India, had a star child: The Indian Shruti Harmonium and became the mainstay of North Indian Classical music, replacing stringed accompaniments. In 1995 one of the guest speakers at the UN Conference on the Role of Women in World Peace, was no ordinary participant. She was Shri Mataji, founder of Sahaja, instructing two Chinese students on the art of meditation. This sparked a slow, yet sure process of the seeping in of Sahaja meditation culture into Chinese hearts which only grew over the next fifteen years. A core component of Sahaja meditation culture is music to sustain the connection gained in meditation. 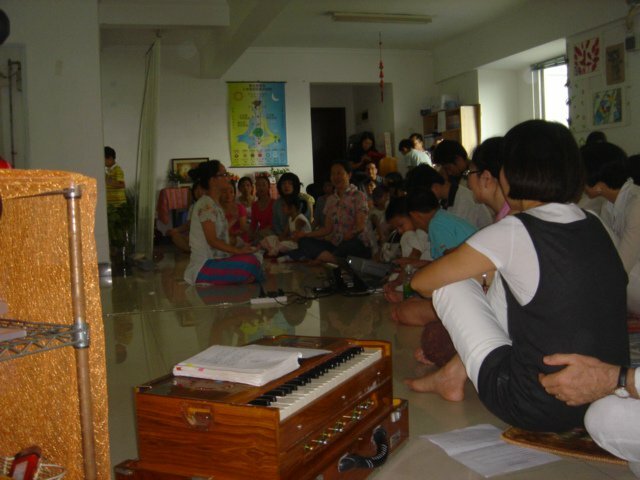 The above picture is from 2011, shows the harmonium a part of the Sahaja meditation session, now a practiced widely with the support of meditation practitioners in Hong Kong, Taiwan and Singapore, which in turn were supported by practitioners from Australia/Malaysia. Vincenzo writes about the latest happenings, media attention and desire of the Chinese to meditate and be at peace. Next stop, Wunan, the central province of China. The harmonium has become the unstoppable messenger of peace. Meditation’s purpose after enlightenment would be to heal the damaged areas of our satisfaction chain or pleasure paths. One method to introspect and discover is to ascertain if going through something inside a balanced amount satisfies us: balanced diet, balanced social interaction, balanced time put in meditation, balanced time with family and human propogation.